Home / Model Supplies / Adhesives / Nitrocellulose Cement / SIG-MENT, 4 oz. 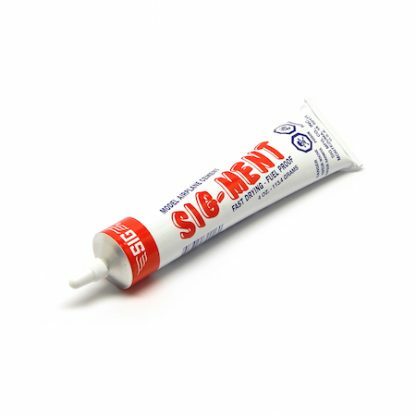 SIG-MENT is a nitrocellulose based general purpose model cement. SIG-MENT is a fast drying and easily sanded model cement, that creates a bond at least as strong as the surrounding balsa wood structure*. SIG-MENT is an old-time favorite for all-around model construction – especially recommended for light-weight Free Flight models. SIG-MENT is great for gluing ABS and some other plastics to balsa wood. Often used in place of the discontinued Ambroid glue product. Type Nitrocellulose Model Cement | Color Straw | Volume 4.0 oz. *Not recommended for bonding high stress areas and plywood parts.